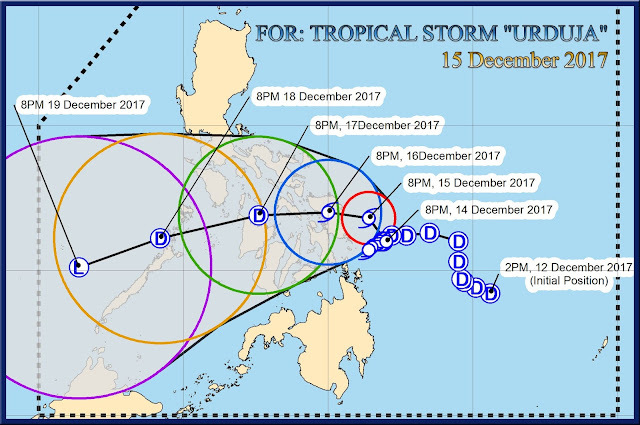 Home Amihan LPA Northeast Monsoon PAG-ASA Tail-End of a Cold Front Tropical Storm Urduja Weather PAGASA Severe Weather Update for Tropical Storm "URDUJA" (KAI-TAK), 14-15 December 2017. PAGASA Severe Weather Update: TROPICAL STORM "URDUJA" HAS MAINTAINED ITS STRENGTH WHILE REMAINING ALMOST STATIONARY. At 1:00 AM today, the center of Tropical Storm "URDUJA" was estimated based on all available data at 155 km East Northeast of Guiuan, Eastern Samar (11.3 °N, 127.1 °E) with maximum sustained winds of 65 kph near the center and gustiness of up to 80 kph moving Northwest at 5 kph. Expected to make landfall over Eastern Samar between tomorrow evening and Saturday morning. Estimated rainfall amount is from moderate to heavy within the 450 km diameter of the Tropical Storm. Scattered to widespread rains will continue over Eastern Visayas and Caraga and is expected to prevail over Bicol Region and the rest of Visayas within 24 hours. Residents in these areas are alerted against possible flashfloods and landslides. PAGASA Severe Weather Update: TROPICAL STORM "URDUJA" CONTINUES TO BRING RAINS OVER EASTERN VISAYAS AND CARAGA WHILE MOVING SLOWLY. At 10:00 PM today, the center of Tropical Storm "URDUJA" was estimated based on all available data at 140 km East of Guiuan, Eastern Samar (11.1 °N, 127.0 °E) with maximum sustained winds of 65 kph near the center and gustiness of up to 90 kph moving Northwest at 6 kph.